Few business folk like the V word. Indeed, when it comes to putting together a long-term strategy for growth, volatility is positively avoided. 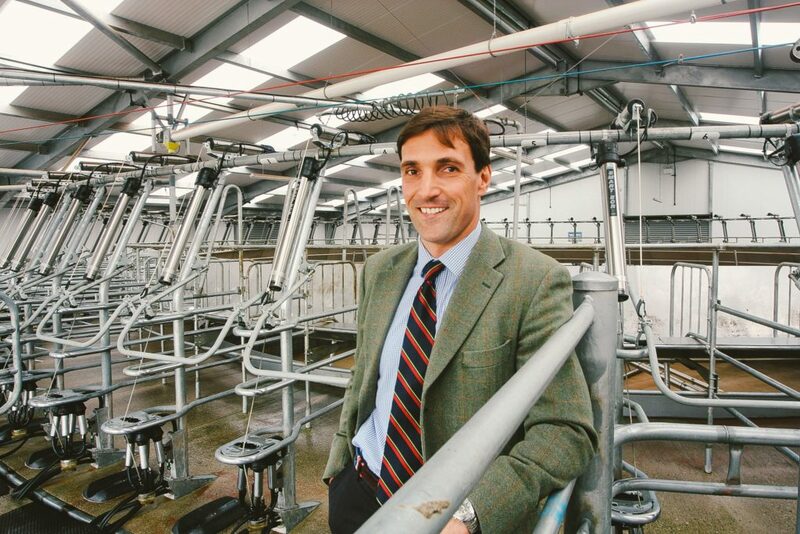 James Thompson knew that milk was a volatile commodity when he invested £3m into livestock and a state-of-the-art dairy parlour at the Sansaw Estate in Shrewsbury in 2012. But his meticulous attention to detail and forensic planning on a ‘worst case scenario’ basis meant Sansaw was able to cope with the peaks and troughs. His vote of confidence in the industry was based on running the Estate’s new enterprise on a New Zealand management system. James, managing director of Sansaw, near Shrewsbury, started with 1,500 cows. The majority graze outside all year round, an incredible feat. Previously, Sansaw was home to a mixed farm rearing pigs and heifers and growing vegetables and cereals. Under James’ tenure as managing director, he also oversaw the creation of the RIBA Award-winning Sansaw Business Park, now home to more than a dozen firms including Carter Jonas and Dechra. A former Royal Marine with command experience in Iraq and Afghanistan, James carried out years of detailed research into what was best for the location before choosing dairy. he explains. “There are a lot of milk buyers in the region, too, so that was another huge factor.” The investment, with the next 25 years in mind, has transformed the farm, which now boasts a 70-bail Waikato milking parlour, running seven hours a day, cow tracks and underpasses, a collecting yard and a feeding area. The cows are based on the New Zealand Friesian-Jersey crossbreed, but there are also Holsteins and Shorthorn crosses in what James calls a United Nations of cattle. He sourced his stock from around the British Isles – from Cornwall to Dumfries and Galloway to Ireland. “I visited other spring calving herds to find what I wanted and it involved lot of travelling and also some tough negotiations,” he said. Doing it the New Zealand way has been crucial to success because the running costs would be too high otherwise. “We aim to keep the cows outside for as much of the year as possible – hopefully from February to early December if we manage the grass right. More than 1,800 acres are dedicated to the dairy enterprise with majority of the land in grass but the farm also grows fodder beet and whole-crop wheat to feed the cows in winter. The cows spend the majority of the year at grass and are fed a small amount of concentrate in the parlour. James believes that the long-term view allows the business to withstand the fluctuations of the dairy industry because of his low input costs, pointing out that is more about the cost of production than the milk price. Cows average around 5,000 litres a year and are likely to complete 5 to 8 lactations during their time at Sansaw. Although not from a historic farming background, James’ approach has brought about more jobs and more investment.